The popular cyber security and antivirus company Kaspersky has unveiled its new hack-proof operating system: Kaspersky OS. The new operating system has been in development for last 14 years and has chosen to design from scratch rather than relying on Linux. Kaspersky OS makes its debut on a Kraftway Layer 3 Switch, CEO Eugene Kaspersky says in his blog post, without revealing many details about its new operating system. The Layer of 3-switch is the very first tool for running the Kaspersky OS, which is designed for networks with extreme requirements for data security and aimed at critical infrastructure and Internet of Things (IoT) devices. What's new in Kaspersky OS than others? Kaspersky OS is based on Microkernel Architecture: The new secure OS is based on microkernel architecture that enables users to customize their own operating system accordingly. So, depending on a user's specific requirements, Kaspersky OS can be designed by using different modifications blocks of the operating system. Kaspersky OS is non-Linux: Yes, one of the three major distinctive features of the new OS mentioned by Kaspersky is that the GUI-less operating system has been constructed from scratch and does not contain "even the slightest smell of Linux." "All the popular operating systems are not designed with security in mind, so it is simpler and safer to start from the ground up and do everything correctly. Which is just what we did," says Kaspersky. But what makes Kaspersky OS Hack-Proof? It is the operating system's inbuilt security system. Yes, Kaspersky OS inbuilt security system has the ability to control the behavior of applications and the OS modules. Kaspersky OS claims itself as practically unhackable OS, because for gaining unauthorized access, any hacker would need to break the digital signature of an account holder, which is possible only with a quantum computer. "In order to hack this platform a cyber-baddie would need to break the digital signature, which – anytime before the introduction of quantum computers – would be exorbitantly expensive," says Kaspersky. Kaspersky talked about the recent DDoS attacks that affected numerous websites in past few months. He guaranteed that Kaspersky OS would protect devices, such as industrial control systems, SCADA or ICS, and IoTs, from cyber attacks. The most severe one was the recent massive DDoS attack on Dyn's DNS servers, which knock down popular sites like Amazon and Twitter. The attack was carried out by Mirai botnets that had infected smart devices like security cameras. So, Kaspersky says it is mandatory to protect the IoT and other critical infrastructure (like industry, transport, and telecoms) from IT threats. "I also hope it's clear that it's better – no matter how difficult – to build IoT/infrastructure devices from the very beginning in such a way that hacking them is practically impossible. Indeed, that is a fundamental goal with Kaspersky OS," he says. 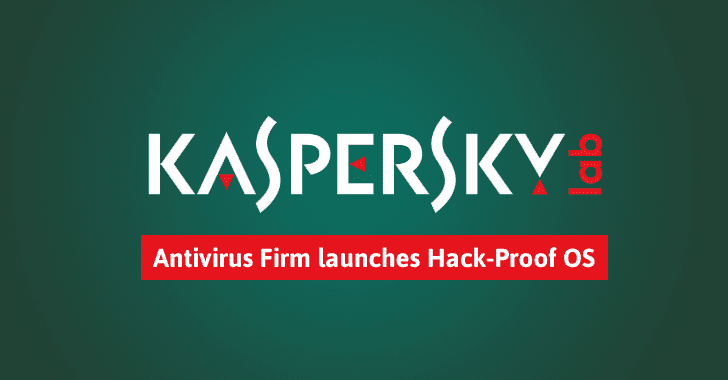 More details about Kaspersky's secure operating system is coming soon. Stay Tuned!